DO NOT remove or poke holes in the wrap. For one potato, microwave on HIGH for 8 minutes. For more than one potato, microwave on HIGH for 6 minutes per potato. Cut a slit lengthwise in the potato(es), gently fluff or mash the flesh with a fork, add your favorite baked potato toppings and enjoy! Cut the sweet potato(es) open lengthwise. 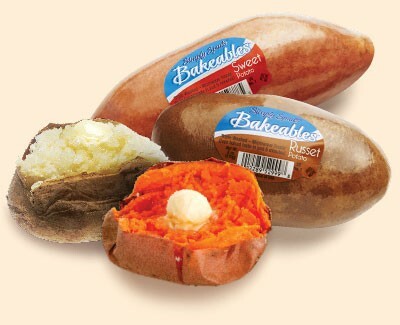 Gently fluff or mash the sweet potato flesh with a fork, add your favorite sweet potato toppings and enjoy! *CAUTION: Potato will be HOT. Handle and remove wrap with care. Cooking times may vary. Do not refrigerate before cooking. Store in a cool, dark place.